USD 2.75/pieceUSD 4.05/pieceUSD 4.99/pieceUSD 4.15/pieceUSD 3.13/pieceUSD 2.04/pieceUSD 2.98-4.77/piece Strong Sucker Kitchen Storage Organizer Holder Hooks Wall Mounted Mop Holder Brush Broom Hanger Rack Features 100% brand new and high quality Perfect for hanging mop, broom, umbrellas, etc. Made of high quality plastic material, sturdy and durable. 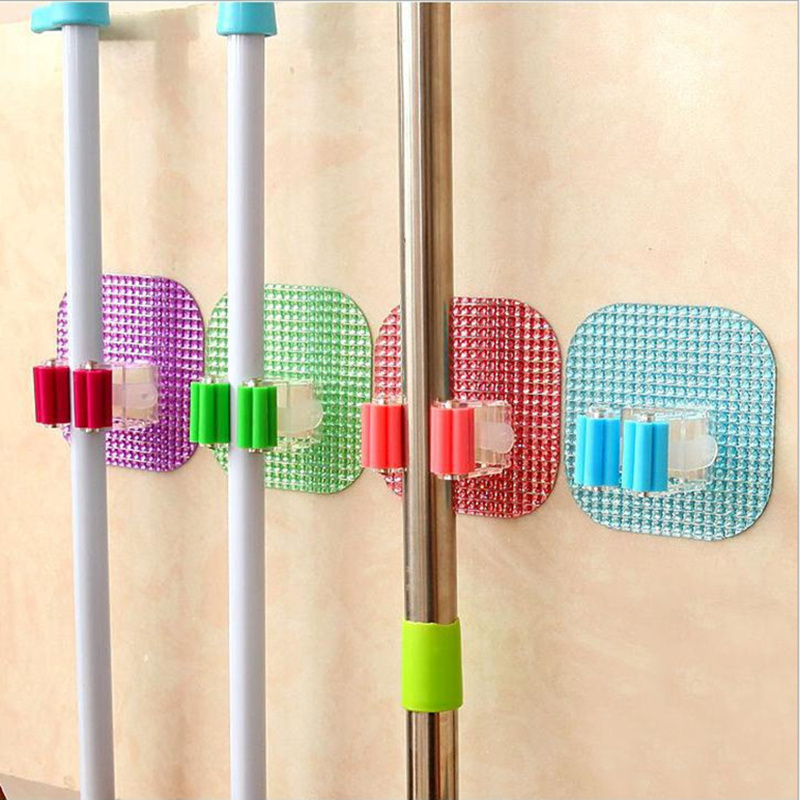 Hanging up the mop after using, which can quickly drain water and according to color to distinguish the mop. Uasge Firstly, you can clean adsorption surface, and then face suction cups on the wall, hang the mop Specifications Material: Plastic Colors: Red, Green, Blue Size: 9*9*5cm Package Includes: 1* Suction Type Broom Mop Handle Holder Shipping Press A.We will dispatch the products within 3–7 days upon the system confirm your order. B.We will ship the order by China Post Air Mail/ 4PX Singapore Post /ePacket/China Post Ordinary Small Packet Plus,The fast shipment(DHL/EMS) are available, but you have pay the shipment fee for it. C.We do not garantee delivery time on all international shipment due to differences in customs clearing times in individual countries,which may affect how quickly your product is inspected. Please note that buyers are responsible for all additional customs fees,brokerage fees,duties,and taxes for importation into your country. Thess additional fees may be collected at time of delivery. We will not refund shipping charges for refused shipments. The shipping cost does not include any import taxes,and buyers are responsible for customs duties. D.The images shown are not the actual item and are for your refence only. Payment Feedback Your satisfaction and positive feedback is very very important to us, which make us more confident to develop business and serve you better.If you are not satisfied with our product or service, please feel free to contact us . We will reply you as soon as possible! Refund Policy Guarantees 100% satisfaction to all our customers. 100% SAFE shopping guarantee. If you received a wrong, damaged, defective item, or item not as described, You are welcomed to contact us for a partial/full refund or replacement. Buyers can return it within 7 days, we are happy to help you with refund or exchange after we receiver the item.Please contact me before you sent it back. Note We do not responsible for any custom duty or import tax. Import duties, taxes and charges are not included in the item price or shipping charges. These charges are the buyer’s responsiblity.